So if you follow me at all on this blog you may suspect I have a thing for mini albums. The idea of one smallish album being home to a single story really gets the creative juices flowin' for me. Don't get me wrong, I am still a traditionalist when it comes to the 12x12...one of those die-hards that does not believe traditional scrap booking is dead...but that is another post for another time. So when Heidi introduced in her MemoryFilesLive class a new use for the ChipboardMemoryFiles I immediately fell in love. There is also a CreateToRemember video that shows off how this is put together. Of course mine went slightly different...because that is how I roll...couldn't just do it like all the rest. No, instead I trimmed the bottom of one of the shaped mini chipboard files so that I could use the shaped one and it still sit on the desktop as it is suppose to. What really makes this such a fun project for me is that it is a display piece. The right side of the file is sort of a bulletin board if you will. Notice I used an everyday office supply clip to hold the photo of mr. pate and I. So what a great event to have out for display. I treated the right side 'bulletin board' just like any other layout. Lots of layers of paper, words, chipboard embellishments, wood veneers, tags...just what I do already, only a little bit more miniature. The left side of the 'album' is a photo stack I made with NoLimits pattern paper. It is a great way to still get a whole lot of photos in one place. There are thirteen pictures in the photo stack with the dimensions of either 3x3 or 3.5x2.5. A peak into how those are all arranged inside the stack. Gosh I love the diversity of paper arts and story telling these days. 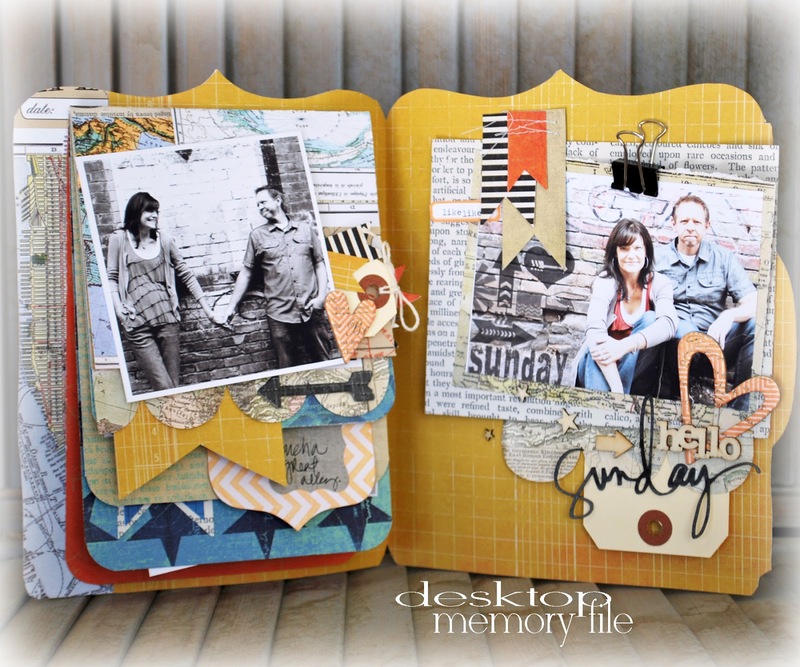 There are so many ways to show off those precious memories. and still be such a show piece. This one sits right next to the TravelMemoryAlbum and tells a complete story that my family reaches for very often. Love how this keeps the memories alive. Love how it keeps us connected. Love how we remember these special times in our lives. Now go...check out Heidi's video for this project. but I know that I am going to be making several for Christmas as well. This is so awesome!!! Love all of the details. and another project of yours that simply takes my breath away!